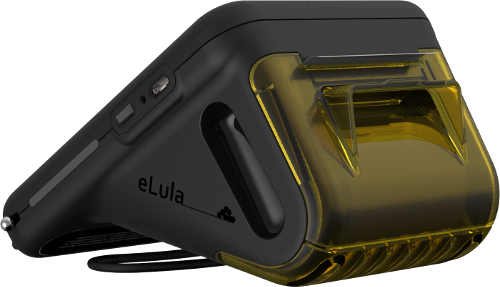 eLula facilitates remote cash-based transactions in transient and informal African contexts. Merchants are able to sell a variety of services and utilities, such as airtime and water, to customers on-the-go. For example, users queuing at taxi ranks, or drivers waiting at traffic intersections. It is a second-generation device which iteratively builds on user feedback and maintenance records from the first-generation device, as well as new technology opportunities. The device makes use of an electronic-ink (eInk) display and an enclosure that is waterproofed to IP67. It is also drop-tested from one-meter onto a concrete surface. The printer mechanism, which was recorded as a key failure point when the previous generation device was dropped, was redesigned with a nesting dampener to absorb impact. Another improvement was inspired by fieldwork observations, in which it was noted that failed printer pin-hinge doors were replaced with a paper bridging sticker. Using a similar method, a live-hinge was incorporated into the door resulting in a highly durable and flexible mechanism.